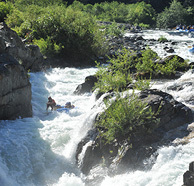 Norm and Phiillip Schoenhoff have owned Whitewater Excitement since its inception in 1978. They are still involved in leading some of the river trips and are always on hand to help their staff and guides to organize the trips. This personal touch is unmatched by any other company in the industry and assures that our guests receive the quality and safety they expect in their adventures. 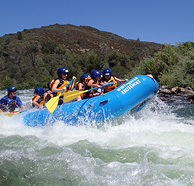 Whitewater Excitement is one of the elite California rafting companies and naturally attracts some of the premier guides and best support staff in the industry. Understanding that our staff is our frontline and foundation for every guest’s experience, we pay our guides and staff one of the highest rates and provide them with the best benefits. It is not surprising that we have one of the highest staff retention rates of any company in the industry. We strongly believe that by creating a caring, fun, and growing atmosphere for our staff will result in a rewarding experience that our guests will long remember. Norm's first trip on the river was May 1973, where he was guiding some friends down the South Fork in a old rented military styled raft. 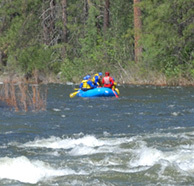 After that trip, "I was hooked on whitewater rafting and kayaking". He is one of the very few rafting company owners that still gets out on the river and guides. 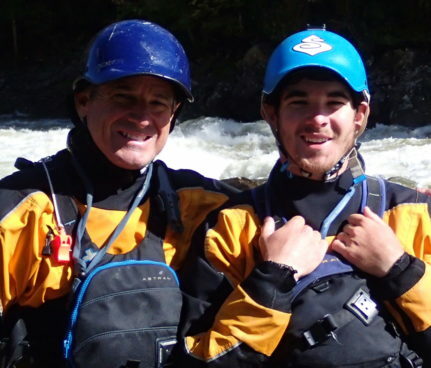 At a very young age, Phillip, was introduced to whitewater, and since then he has rafted and kayaked all over the US and several other countries. "I Love sharing my passion of the river with people of all ages and experience levels. Theres nothing quite like introducing the river to someone for the first time." Glen, AKA "Flash", began his journey in whitewater rafting in 1985 as a commercial guest of Whitewater Excitement. The next year he went through our guide school and we cannot seem to get rid of him. He has traveled the world whitewater rafting, and is a wealth of information for sure. His favorite answer to the most asked question - How deep is the water? Chest high to a duck! Ryan, another local boy from the Coloma area, came to us 8 years ago as a high school senior looking for work as a river guide. When asked why he wanted to be a river guide, and he answered "for the thrill of it of course". He has since matured into one of our trip leaders and most requested guide. He is working on his degree at Chico right now and will be back this spring and summer for another year of thrills! Jay is a Bus and Van driver extraordinaire. He drives for the local school district during the school year and for Whitewater Excitement during the summers. Mikey has been with us for 12 Years and has become one of the more respected guides and trip leaders on the river. A super skilled and adventurous kayaker on days he is not guiding, Mikey always has a smile on his face and loves to meet new rafters. He is working on his master's degree and is looking forward to teaching. We first met Jack at our guide school meet and greet session. Jack was a 15 year old young man that could not stop smiling the entire time. He was young to begin with and was told he might not work his first year due to his age. Fast forward 6 years and Jack is one of our most popular guides. Snow Cat Operator in the winter and raft guide in the summer, Jack lives the life. He suggests a stress free diet with a good helping of smiles and fruit snacks. A local product of the American river area, JT came to us in 2015 after our guide school was over, and said he wanted to become a river guide. We told him to come out and raft with us and see if he could learn the river and skills needed to guide. Well, he was awesome, learned them quick and became one of our best new guides that year. He loves to fly, hang out with friends, and of course getting on the river as much as he can. Another of our our guides from Chico, CA, Tivon came to guide for Excitement in 2014 and has been with us since. He loves being on the river because it is constantly challenging and rewarding. He doesn't not know exactly what he wants to do after recently graduating college, but he's positive that whatever I do, he will be close to the river. Justin is currently a student at Chico State majoring in marketing and has been guiding for 3 years now and enjoying every part of it! His favorite river trip would have to be our company trip to the Tuolumne River, when he got to raft down Clavey Falls in a mini raft with his pals Scotty and Jake! Josh is from the UK (England) and came to us in 2016 after many years guiding in and around the UK. Josh loves the river scene and travels the world following the sun and the rivers. He just finished a trip to Costa Rica and is coming back for another year on the American. Paul grew up around the river, and after hearing about kayaking from one of his high school teachers, he thought he wold try it out. Well he is now one of the top non professional kayakers around. He began guiding 5 years ago with us and is now one of our top guides. He still enjoys sitting in a raft and sharing his passion with others. Jenna was drawn to the river in high school and began just swimming around and enjoying it. She once saw some rafters float by and thought that looks fun. Jenna went through guide school back 8 years ago and began guiding for WWE. Now she helps inner city young kids learning about the wilderness by getting them out of the city, but still a part time guide and am always thinking about my next time she can come up and get on the river. Outdoor enthusiast Mike Busch took his family on a rafting trip with Whitewater Excitement...then stayed to work for the company, supplementing his real estate activities with a paddle and whitewater! Mike is a big kid at heart with a constant smile, positive attitude, and a love for adrenaline! Jill started with us a guest 9 years ago and and now she is a third year guide. During the off season, she is a student at Northern Arizona University studying Criminology and Anthropology. She also likes to ski and dance, and beware if you're around her when she has a dice in her hand. What can we say other than the name explains her perfectly! She is from San Ramon and is currently a student at Chico State. She can be found painting or playing her ukulele. While she loves rafting, she can also be found talking about missing her cat, Ravioli. Katie just graduated from University of Portland and is back for another season guiding! Any time she’s not on the river, you can find her climbing, camping, backpacking or eating mint chip ice cream. Emily grew up in Southern California and having been recently introduced to the river, she has moved from loving the beach to the river. She currently works for Adventure Outings at Chico State where she leads rafting, backpacking, and snowshoeing trips. Menya hails from Hungary. He graduated from college in early June with a degree in agricultural engineering, and is also a beekeeper. He started guiding in 2014 and has guided 2 seasons in Austria and 2 seasons in Slovenia. He is really motivated year to year to increase his rescue and guiding skills, and even competes in Swiftwater Rescue races. His passion lies in river and this job and he is motivated to go with the flow every day, and find some "spicy lines" on the river. Sofia is here at Excitement for her first season as a guide. She grew up in Santa Cruz, CA and is studying Spanish and Geography at Chico State. She loves traveling, new experiences and connecting with all kinds of people. She excited that she can spend her summer outside, and is stoked to have a job where she can spread the love for the river! Chris started working for Whitewater Excitement in the summer of 2012 because his older brother was a driver and a good friend of Phillip's. He started out just as a jet ski driver to tow boats at the end fo the day. Through out the years of working with the company his want to do more work and more things to help out all the guides as much as possible grew, and now he is the manager. Scotty, a local boy from Auburn, followed in the footsteps of his older brother and started guiding for us 7 years ago. He graduated with an Engineering degree from UCSD and is using it to river guide with us for another season. He enjoys rock climbing when he's not on the river, and has taught almost half the staff this year to rock climb as well! Tanner, known in the Music Industry as DPLX, is with us for his first year guiding. he is from Modesto, California and is currently a senior at Chico State studying graphic design. He loves music, people and getting freaky. Also known as Slim, Isaiah is from Indiana. His older sister guided for us 10 years ago and he figured she cant have all the fun in the family. He’s only 18 but is already on his second year of guiding and has gotten to become one of our most requested guides. He dreams of a life always associated with the river and photography. He also loves his mom. We’ll help you check availability and find the perfect trip!